MODELROCK Gives Lips Vivid Shape! Shape, Play and Slay All Day! A long wear lip definer, MODELROCK introduces Vivid Lip Shapers in both a Skinny & Chubby version! Vivid Lip Shapers are longwear lip shapers that will last for hours and can be layered with any of your preferred MODELROCK Lip products. SKINNYSTIXZ VIVID LIP SHAPERS - Available in 14 shades Create a bold smile with a velvety smooth finish that will last for hours with MODELROCK SkinnyStixz VIVID Lip Shapers. A highly-pigmented Lip Shaper, your colour glides onto lips consistently, easy to blend after application and perfectly defining and shaping your lips. CHUBBYSTIXZ VIVID LIP SHAPERS - Available in 6 shades MODELROCK ChubbyStixz VIVID Lip Shapers will infuse your lips with high impact colour that lasts for hours. They'll glide on effortlessly with a creamy, velvety smooth feel that appears silky matte or pearlescent in colour, providing excellent coverage. Waterproof, long-wearing, and opaque, your Vivid Lip Shapers won't feather upon application nor dry out your lips! Wear your Vivid Lip Shapers alone or partner with your favourite MODELROCK Lipgloss or Liquid to Matte Lipstick for high impact colour pay-off! VIVID LIP SHAPERS are 100% vegan, cruelty- and paraben-free, and free from mineral oil and paraffin. 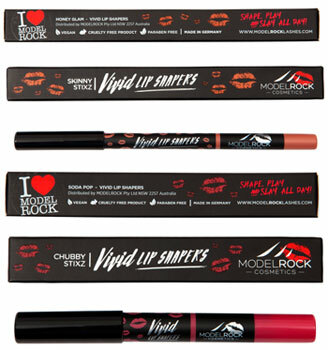 MODELROCK VIVID LIP SHAPERS - CHUBBY & SKINNY $15, each.